Union members will vote on the tentative agreement Saturday. If it's approved, bus service will resume Monday. 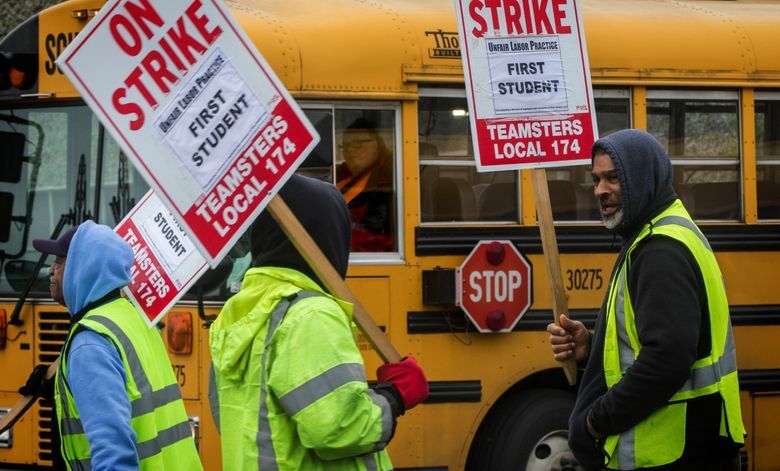 The union representing Seattle’s 400 school-bus drivers and their employer, First Student, reached a tentative contract agreement Friday that will likely end the bus drivers’ weeklong strike. Union members will vote on the tentative agreement Saturday. If it’s approved, bus service will resume Monday for 12,000 Seattle students. Teamsters Local 174 and First Student leaders met Thursday with a federal mediator for the first time since the bus drivers went on strike last week. The talks continued late Thursday night and again Friday morning, Teamsters spokeswoman Jamie Fleming said. The tentative agreement concludes months of negotiations between the union and First Student, as well as a rocky week where both sides refused to reach out to the other, even though they both said they were ready and willing to come back to the negotiating table. City and school leaders, including Mayor Jenny Durkan and district Superintendent Larry Nyland, had urged the two sides to come to a resolution. Affordable healthcare benefits and a better retirement plan were at the center of the contract dispute. The tentative agreement includes an expanded benefits package and comprehensive healthcare coverage for the bus drivers and their families, Teamsters and First Student said in a joint statement. The details of the agreement weren’t released. “We feel strongly that this deal meets the goals set by all parties in these negotiations,” the two sides said in the statement. The union first went on a one-day strike in November after negotiations failed for the first time. Contract talks then continued through the end of January, when the union rejected First Student’s latest proposal and declared a strike. On the picket lines, bus drivers told stories of having to declare bankruptcy, pay for expensive medication out of pocket or live paycheck to paycheck because their healthcare plan was unaffordable or they couldn’t get enough hours to be considered a full-time employee. Bus drivers are currently paid between $18 and $25 an hour, and drivers who work 30 hours a week or more are eligible for health-care benefits. First Student reiterated in several statements throughout the strike that it cares deeply about its drivers and that its benefits proposal was fair and equitable. The company offered additional pay, guaranteed hours and lunch to drivers who crossed the picket line, and at least 50 drivers showed up for work each day. Those drivers covered about one-third of all bus routes, with priority given to routes for special-education students and students in low-income schools. Not all drivers who reported to work during the strike had the appropriate training to drive special-education routes, so some of the 2,300 special-education students were still left without service. Under the federal Individuals with Disabilities Education Act (IDEA), school districts are required to provide transportation for students with a disability if it’s part of their individualized education plan (IEP). Families of special-education students who chose to drive to school will be reimbursed for mileage, the district said. Seattle Public Schools is in its first year of a three-year-contract — worth $27 million a year — with First Student, the largest school-bus contractor in North America. First Student is no stranger to labor disputes and other issues: Two other strikes in Southern California and Montreal, Canada, against the company ended just one day before Seattle’s began. The strike in Montreal lasted two days, while the one in Southern California ended after two weeks. First Student says it maintains more than 350 local union agreements, and there have only been five strikes in the past three years. Unfortunately, the company added, three of those strikes were in the past month. The school district said First Student was the only company to bid when its previous contract expired last year, so it had no other options. While other districts operate their own buses, Seattle says it has no plans to purchase its own fleet. In January, however, the School Board authorized the district to investigate and possibly purchase an 18-acre property in Skyway that would house a bus lot for future bus contractors. Several vendors were interested last year but didn’t submit proposals, citing expensive startup costs, especially those associated with finding land for a bus lot. Before the November strike, the school district sent a letter to First Student threatening to seek damages of $1.2 million per day from the company if a strike occurred. It’s unclear whether the district will follow through on the threat. If it does, the damages will total $9.6 million.